Happy New Year from Maine Safe Routes to School! Imagine People Here is the Bicycle Coalition of Maine's campaign to create temporary traffic-calming demonstration projects. To learn more, please check out the Imagine People Here webpage. In 2017 the program will be creating an Imagine People Here Toolkit and implementing 4 Imagine People Here demonstration projects to inform the Toolkit. If you have a project in mind that you would like to implement this year, please submit a proposal. Proposal application deadline is February 17th. Questions?? Contact Samantha Herr at sam@bikemaine.org. MaineDOT is pleased to announce another partnership opportunity with municipalities in the acquisition and installation of solar­powered radar speed signs at approved locations. These signs have a proven record of calming traffic, particularly in areas where motorists may be traveling over the posted speed limit. MaineDOT's program can provide these signs to municipalities at no cost! These signs would then be property of the municipality. Approval for ownership would require someone from the municipality to attend 4 hours of training, agree to collect data to distribute to law enforcement, and agree to move the signs around to different locations. The program will operate on a first come, first serve basis. To request a sign, please contact Stephen Landry via stephen.landry@maine.gov. Help children dress properly, stay healthy, and travel safely during Maine's winter months. Staying warm and dry helps students focus and perform better in the classroom! Add an extra layer: Teach your kids how to put together outfits with multiple layers, so they can remove one or two after they get to school. Make sure clothing is comfortable and easy to put on and remove. Be sure your child has a good place to store discarded layers during the school day so they can be put back on when it's time to go home. Protect exposed skin: When winter wind and colder temperatures arrive, make sure kids are fully equipped with a winter hat, gloves, and a scarf to keep extremities warm. Make sure your children have appropriate shoes/boots to keep feet dry and warm. Get some traction - Sidewalks may be ice or snow-covered. Make sure children's shoes or boots have ample traction to grip slippery sidewalks. Pack a backup - Consider packing an extra pair of socks or even a full change of clothes in your child's backpack, in case he or she gets wet on the way to or during the school day. Proper snow pants and jackets can also help keep your child comfortable. The ultimate accessory: the water bottle - We don't often associate cold-weather with dehydration, however our bodies don't get as hot and sweat evaporates more rapidly in the cold dry air. Thus, we're tricked into thinking we aren't losing fluids as rapidly as a hot summer day. To avoid dehydration, make sure children are drinking plenty of water before, during, and after school - don't forget to hydrate! For more safe tips on walking, bicycling, and motor vehicle driving safely please visit this bikemaine.org post. Be Smart - Be Alert! * Always look all ways when walking. * Use your eyes and ears to watch and listen for cars, trucks, bicycles, and other pedestrians. Avoid wearing headphones or talking on a cell phone while walking. * Always walk on the sidewalk. If there is no sidewalk, walk facing traffic along edge of road. * Don't assume vehicles will stop - even at a crosswalk! Make eye contact with drivers, don't just look at the vehicle. If a driver is on a cell phone, they may not be paying enough attention to drive safely. * Don't rely solely on pedestrian signals. 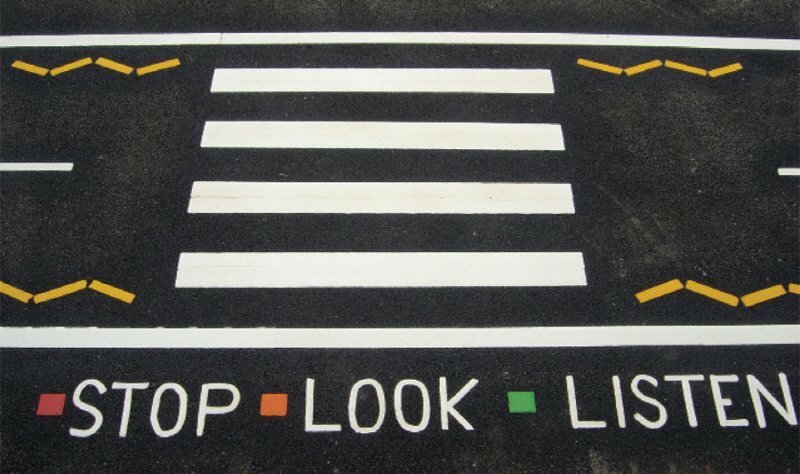 Stop, Look, & Listen before you cross the road. * Be alert to engine noise or backup lights on cars when in parking lots or near on-street parking spaces. We're here to help you strategize, answer questions, and support your community as you make plans for walk and bike activities this school year! The main goal is to get kids in Maine outside and connected to nature. Funding is available to help organizers partner with school groups during this weekend! Don't wait! Applications due Jan 11th! The Complete Streets Consortium Series is an opportunity for three communities from the same state to work closely together to implement Complete Streets-streets that are safe and accessible for people of all ages and abilities. Applications are due Thursday, Feb 2. SRTS Programs can show kids by example and through direct conversation that people can disagree with each other without being hateful or hurtful. Reinforcing the need for continued support of walking and walkability. The vital link between walking and thought.